Nigerian-born model Oluchi is set to embark on another continental-wide search for Africa’s next modelling talent. Oluchi is widely seen as Africa’s first lady of the catwalk having transformed from an ugly duckling, selling bread on the streets of Lagos to the beautiful swan that won the inaugural Face of Africa competition in 1998. The ambitious initiative aimed at portraying Africa in a more positive light and export African models to the fashion hotspots of Paris, Milan, New York and London. Subsequent contests were held in 1999, 2000 and 2001 and won by Namibia’s Benvinda Mundenge, South Africa’s Nombulelo Mazimbuko and Senegal’s Ramatoulaye Diallo respectively. The show then took a four-year hiatus to return in 2005 with additional searches in 2006, 2008 and 2010 before the format was retired. None of the winners of the contests after Oluchi’s racked up as much ramp-time as Oluchi with many tripping on their runways careers and disappearing into oblivion. Oluchi on the other hand became a heavily booked model juggling a successful catwalk and editorial model career. She added a business qualification to boot with her sights set on model management. She was part of the jury in the last four editions of Face of Africa but unfortunately for her, none of the winners from that era left any mark on the continent or internationally. Ironically, some hopefuls that never booked top 5 finalist slots have gone on to outshine the winners of Face of Africa. Uganda’s Patricia Namayirira continues to create waves in Cape Town, South Africa where she is based for the past 13 years. Another Ugandan ramp success story is Lucy Ssuubi Torr who could only manage a Top 10 slot at the 2008 finale but is enjoying an illustrious career based in Toronto Canada. 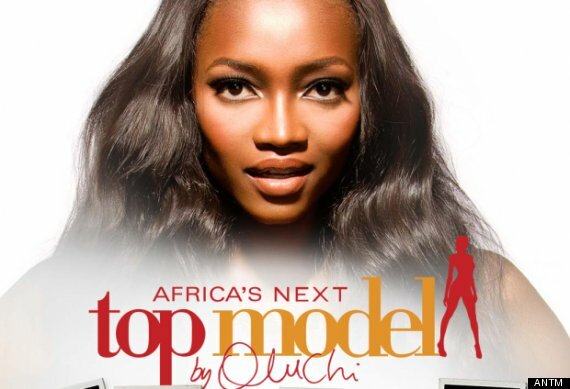 Oluchi’s latest assignment is modelled around the popular Tyra Banks America’s Next Top Model format. And rather than groom the hopefuls on the continent using the various idyllic venues that hosted Face of Africa model boot camps, Oluchi will ferry her Africa’s Next Top Model hopefuls to austerity-hit Spain. It is hard to say if this attempt, visibly a rehash of the defunct Face of Africa contest will yield tangible results by way of the long shelf life Oluchi continues to enjoy 15 year on. A more thought-through format would have been a spin-off of Heidi Klum’s Project Runway which integrates another vital aspect of the fashion industry; the designer into the contest. Here, designers are challenged to sketch, cut and sew imaginative fabric creations that are presented before an able jury. They work alongside models to bring their designs to life. Oluchi can still use her continental pedigree to draw attention to herself and make the dream of a lone girl come true. But right about now, the continent could use a contest that brings together the other cogs that complete the fashion wheel; designers, photographers, bloggers, make-up artistes et al to foster what is fast becoming a hard-to-ignore industry whose showcase spots stretch from Lagos to Nairobi, Kigali, Dar-es-Salaam, Maputo, Johannesburg, Soweto and Cape Town, each venue boasting a bustling fashion week event. This entry was posted in Uncategorized on May 30, 2013 by kampala1ne. How do I enter for Africa’s next top model? Hi, please check out http://www.antmafrica.com. They are also on Facebook as Africa’s Next Top Model. I want to enter for africa’s next top model. how do I enter? Kindly go online to http://www.antmafrica.com. All the requisite info is there. And you do not have to be a citizen of the listed countries. You only have to travel to those respective countries. I hope this helps.